Because of RVing, we made a new friend around 1.5 years ago. Like us, he RVs full-time, but he used to live on a sailboat. After months of talking about it, we finally decided that we would go on a sailing trip together. 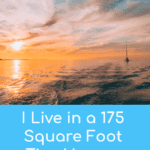 Me and Wes knew that sailing would eventually be our next adventure, so this seemed like a fun vacation to help us decide if we would really enjoy it. So, in June of 2017, we took a 10-day sailing charter in the British Virgin Islands with our RV friend and two other couples. This ended up being one of the best trips I've ever taken. 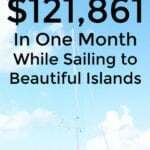 Plus, I was still able to earn a great income even though we were sailing and on vacation for the majority of the month as you can read in How I Made $121,861.28 In June While Sailing to Beautiful Islands. We've been to the Virgin Islands numerous times, but we had never been to the British Virgin Islands, and this was our first sailing trip. Actually, I had never even been on a sailboat before. 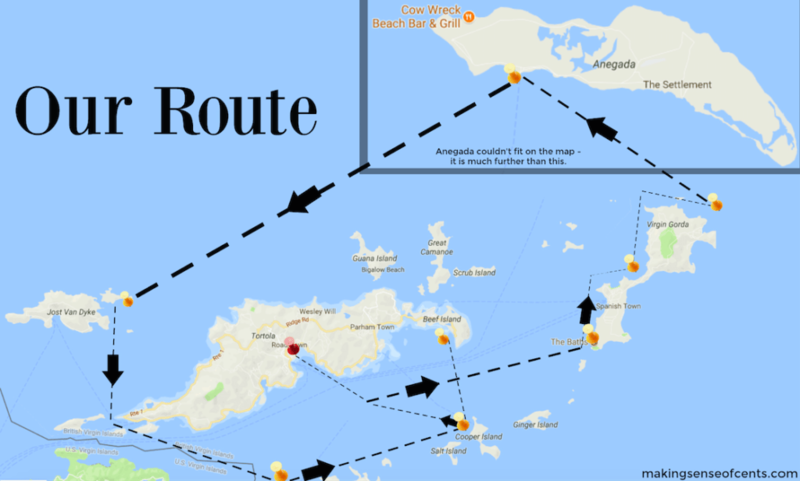 Road Town, Tortola – This is where our sailing charter began and ended. 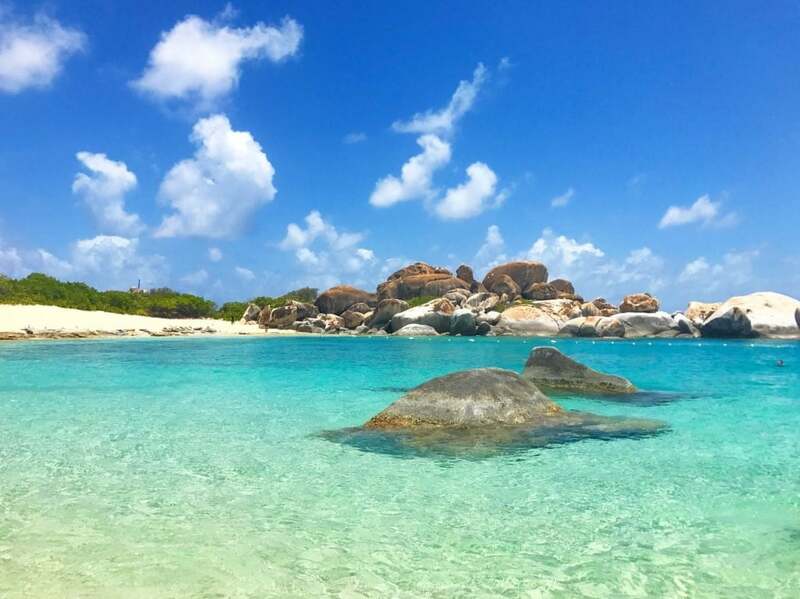 Virgin Gorda – We went to the Baths, which I had wanted to visit for a while, and they were amazing. We also anchored in Savannah Bay for two nights. There was a lot of climbing on rocks, beautiful water, and more. We visited the North Sound of Virgin Gorda and went to Bitter End Yacht Club (we moored there) and Saba Rock. 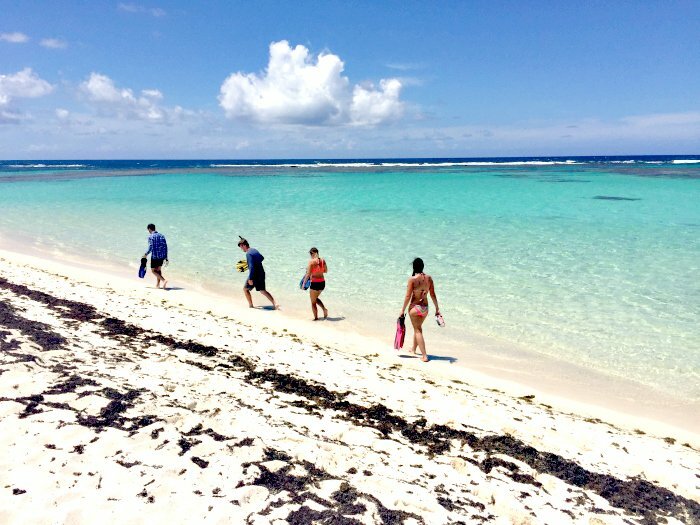 Anegada – Everyone on our charter was looking forward to visiting this island. 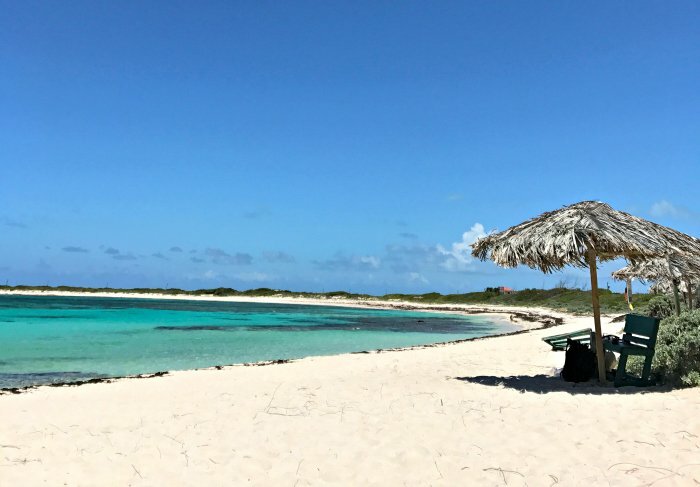 Anegada has beautiful, secluded beaches, like Loblolly Beach, which we spent a day at. 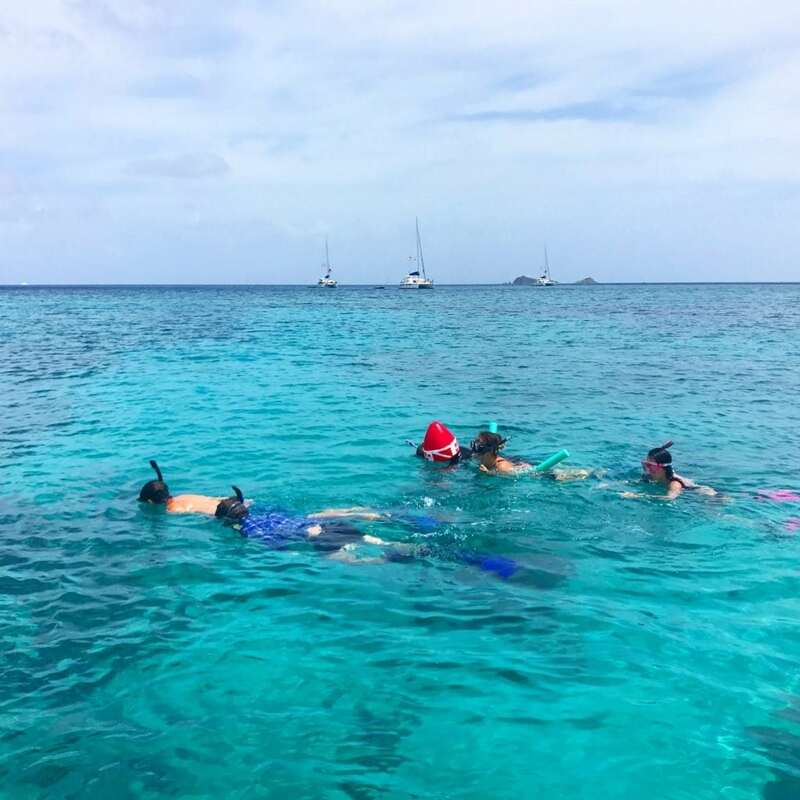 We visited some of the great snorkeling areas and saw a stingray, and we even saw flamingos! We stayed here for two nights, and it was amazing! This was our longest sail, and we even had a dolphin swimming with us as we sailed. Sandy Spit – This island is tiny, with not much on it, but it is surrounded by beautiful blue water. We anchored here for the night and went to Foxy's for drinks and hiked to the Bubbly Pool. Norman Island – We moored at Norman Island so we could go to Willy T's, which is a floating party bar where you can jump off the top of the boat and into the water. The Indians – We went snorkeling at The Indians and were able to experience some of the best snorkeling I have ever done. There were tons of fish, and we even saw a large barracuda and a puffer fish! Beef Island – We tried to visit Cooper Island but all of the moorings were taken. So, we sailed over to Beef Island for the night and anchored by ourselves. 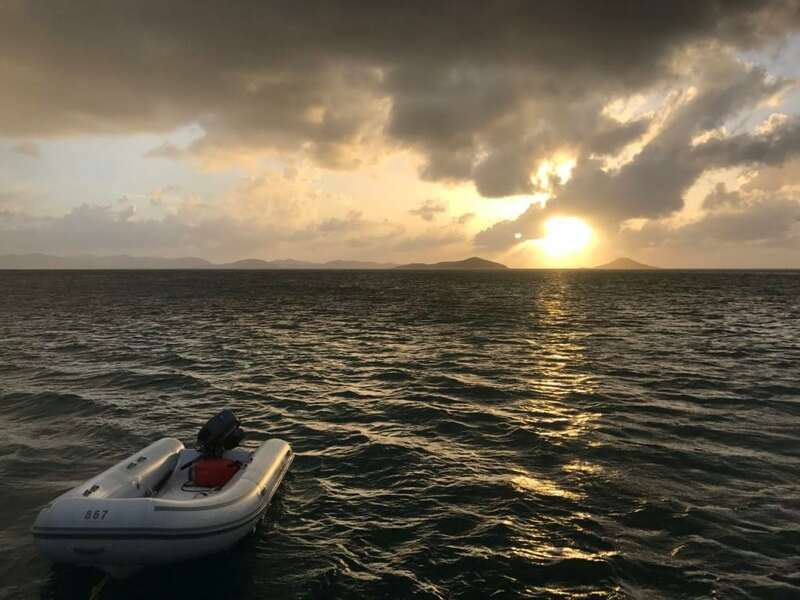 Cooper Island – We woke up early to sail back to Cooper Island. This was a beautiful places to spend our last day on the charter. Even though it was the slow season, the mooring balls filled up by noon, and many sailors were “parking lot stalking” and waiting for sailboats to leave. Get there early if you go! While we visited we saw a sea turtle and dolphins. We were on a Sunsail 51 – 4 Cabin Monohull Yacht, and some people might think that’s crazy for seven adults. However, no one complained about the space, and it really ended up being plenty of space for our group. Getting to the sailing charter. Because St. Thomas is the largest and usually the easiest airport to fly into, most people tend to fly to St. Thomas in the U.S. Virgin Islands and then take a ferry to Tortola, where Sunsail and other charter companies are located. Our trip actually started by first flying from Portland (that's where we left our RV) to Dallas, then to Miami, then to St. Thomas. After arriving at the STT airport, we took a five minute taxi ride for about $10 (for the both of us) to the Charlotte Amelie ferry dock. We then hopped on the Road Town Fast Ferry to go from St. Thomas to West End, Tortola. This took around 45 minutes and cost about $100 for the two of us. You can find ferry information here. After we arrived and went through customs to clear into the British Virgin Islands, our Airbnb host picked us up from the ferry dock because the driveway to her Airbnbs was incredibly narrow, steep, had very sharp turns, and most taxis could not do it. We completely understood when we arrived! We stayed at the Airbnb for a few nights (it had AMAZING views), waited for some of our friends to arrive, then headed over to Sunsail, where we would bareboat charter a sailboat. This was our sailboat – Annie Daydreaming. As I said earlier, we were on a Sunsail 51 – 4 Cabin Monohull Yacht. Sunsail is one of the biggest sailboat rental companies in the world, with locations all over. This was a Jeanneau sailboat, around 50 feet with four bedrooms and four bathrooms. While all of the cabins were on the smaller side, everyone was able to sleep and have their own space, which was nice. We didn't have to refill the water tank the whole 10 days, we had plenty of diesel to run the ACs at night time (it's hot in June in the Virgin Islands), and we had plenty of space for food. Our skipper and first mate. Like I said at the beginning of this post, our RV friend used to live on a sailboat, so we made him our captain. This meant we were able to bareboat charter our sailboat, and sail on our own. Wes also took on some of the sailing responsibilities because he has taken an 8-day sailing course and has also sailed with his uncles a few times. So, the rest of us put our lives in their hands, and it went well! 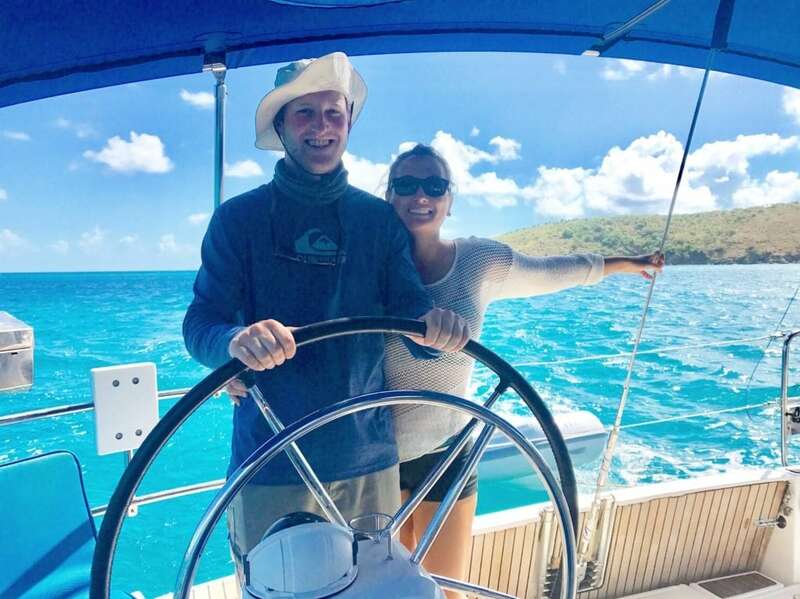 If you are interested in a sailing charter, but you don't know anyone who sails, Sunsail (the sailboat charter company that we used) will provide a captain for your trip for an additional cost. 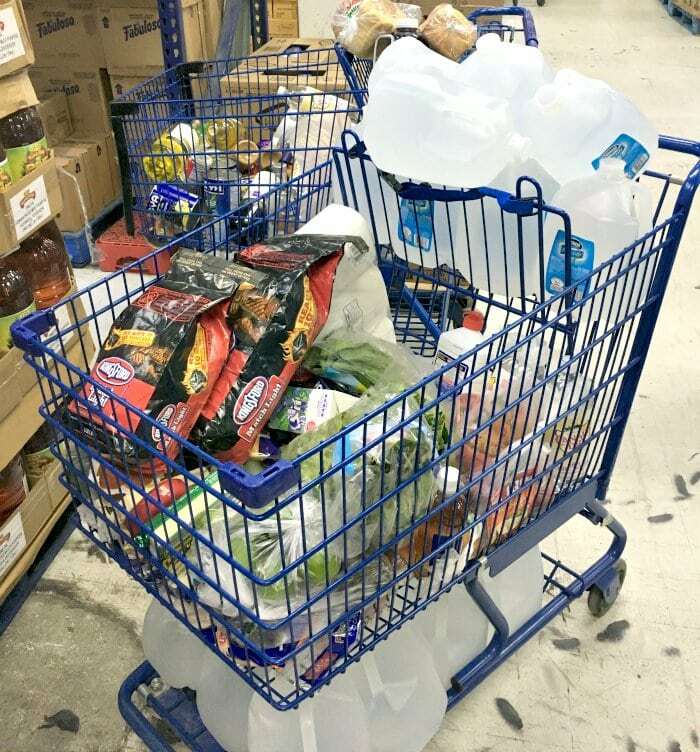 We provisioned beforehand and bought a TON of food and drinks. What did we eat on the sailing charter? The day we got the sailboat, we spent some time getting provisions for the trip. It took a few hours and a couple of grocery stores. We went to the Rite Way in Road Town as well as OneMart Superstore. Rite Way was more comparable to a grocery store in the United States, with many of the same food and displays I am used to seeing in the states. In total, for seven people and 10 days, we spent $3,808.40 on food, groceries, restaurants, pina coladas, and more. 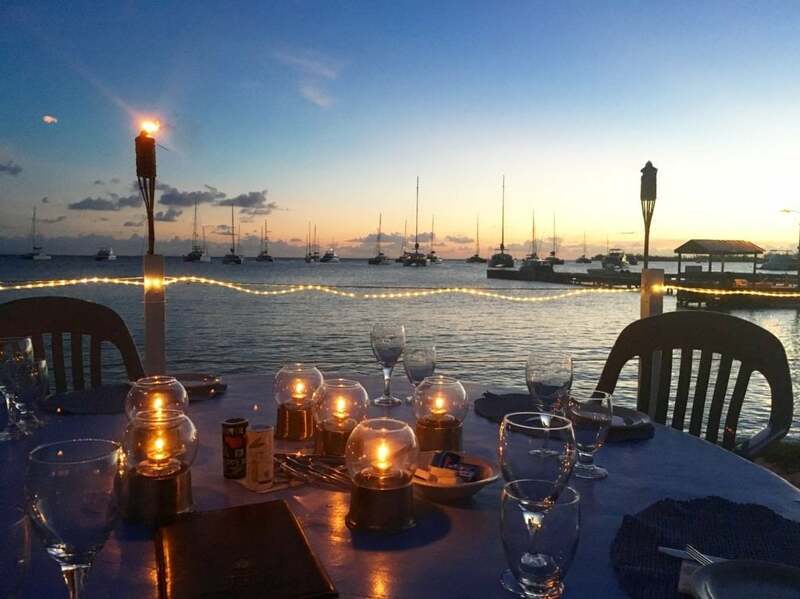 We could have spent way, way, way less money on food, but we splurged on a few experiences, such as going to Saba Rock and having two lobster dinners in Anegada. We also overprovisioned and ended up giving away a ton of food and alcohol to another group who were about to start their chartered vacation. 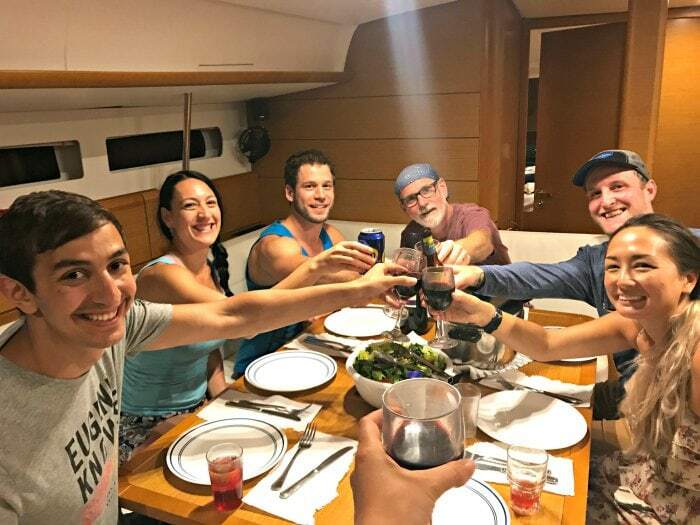 Honestly, our best meals were actually on the boat, as we had many great cooks (this goes to you, Scott and Nicole!). Plus, I realized that everything just tastes better on a boat (like how I think everything tastes better in an RV). Did I get seasick on the bareboat charter? I have a stomach that gets upset quite easily. I don't get sick in the RV, but oddly enough, I do get carsick whenever someone other than me or Wes drives. Much to my surprise, I didn't get sick at all during the 10-day trip. Actually, many of the people on our trip got seasick, so I was really surprised when I didn’t. If you normally get seasick, there are many things you can do to try to prevent it, such as taking Dramamine or Bonine, wearing a sailing bracelet, getting a seasickness patch, and so on. People on our sailing charter tried a combination of all of these. This picture was taken just moments after getting the sailboat charter. What did I love about the BVI sailing trip? I loved everything about the sailing trip. Honestly, I could have spent the entire 10 days just on the boat. However, the British Virgin Islands are beautiful and deserve to be explored. Being able to create our own schedule. We could decide where we wanted to go each day and what we wanted to do. Being able to explore multiple islands. We went to so many different islands without feeling rushed because we were on our own sailboat. Having places to ourselves. 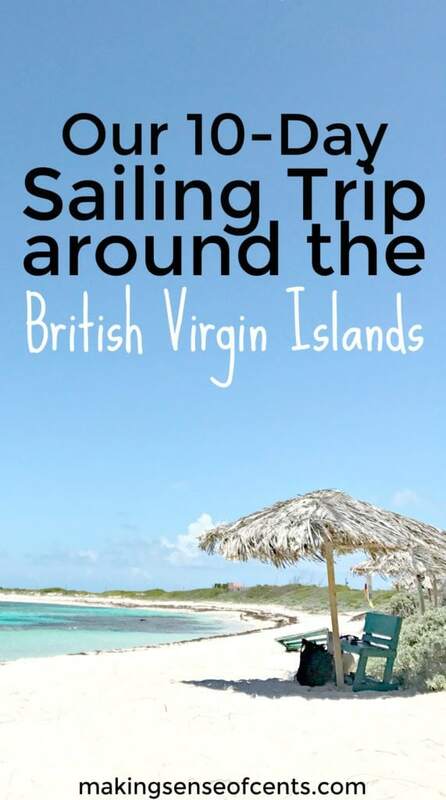 Because the British Virgin Islands are such a popular place for sailing charters, we were constantly around people, especially when we were mooring or anchoring. However, we did get to experience a few nights with very few people around, once all by ourselves. It was very peaceful! Seeing beautiful places. The sunsets were amazing, and we experienced some amazing snorkeling, great hikes, and more. I know I keep saying it, but really, everything was amazing. 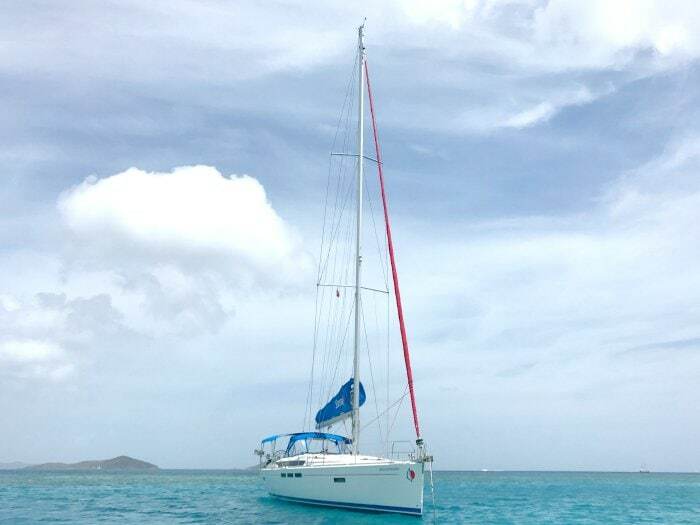 I definitely recommend going on a BVI sailing charter trip of your own. Looking for more sailing charter tips? You have to pay a customs fee for both entering and leaving the British Virgin Islands. These were each paid at the ferry dock since we took a ferry. From what I’ve read, the fee seems to vary, and our entry and exit fees were around $20 per person each time. You do need a passport to visit the British Virgin Islands. When going back to the St. Thomas airport to fly home, you have to arrive very early. When we were there, the minimum check in time was 180 minutes prior to departure, and just checking bags or getting boarding passes required 90 minutes! We have heard about people that, despite making their flight, were turned away because they weren't there before the minimum check in time. I recommend using soft-sided luggage, like a duffel bag or soft backpack, on the sailboat. Sailboats don’t have a ton of storage space, so being able to stuff your luggage into a small cabinet is key. For internet on the sailboat, I used my iPhone as a hotspot and signed up for ATT's International Day Pass. It was $10 for each 24 hour period, and I was only charged for the days that I used to service, and I was able to use my same cell and data plan from home. This allowed me to check in on the business every so often and the connection was solid. Bring clothespins so that you can hang your clothes on one of the life lines. Go through your checkout list before you set sail. You want to make sure that you have everything you need in order to sail, that everything is in working order, and so on. We were missing some wine glasses, and I'm glad we did a check before we set sail! The important things in life, right? Put something on your dinghy, like a handkerchief, that makes it look different from the others. Nearly all dinghies look the same, which can make it hard to easily find yours. One day, I was trying to tell everyone that we got on the wrong one, and it turns out we were on someone else’s dinghy for a 30 second ride. Leave the heavy makeup, hair curlers, straighteners, blow dryers at home, but do bring all of the underwear you have. 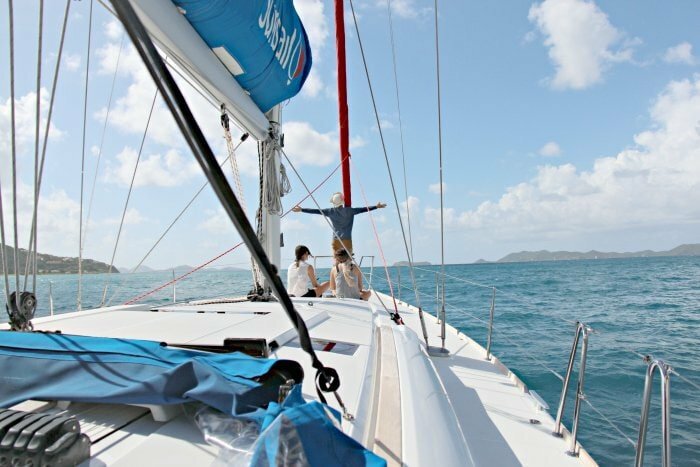 Most of all, be polite and have fun on your sailing charter in the British Virgin Islands! Well, there you have it! This was really one of the best trips I have ever taken, and writing this trip recap and review has made me a little emotional thinking about all the fun we had. Are you interested in going on a sailing charter in the British Virgin Islands or somewhere else in the world? Why or why not? Here are some pictures from our sailing charter in the British Virgin Islands. Some of the pictures are from our friends who were on the sailboat rental with us, such as Jake and Liz. Loblolly Beach on the island of Anegada. Eating dinner on the sailboat. 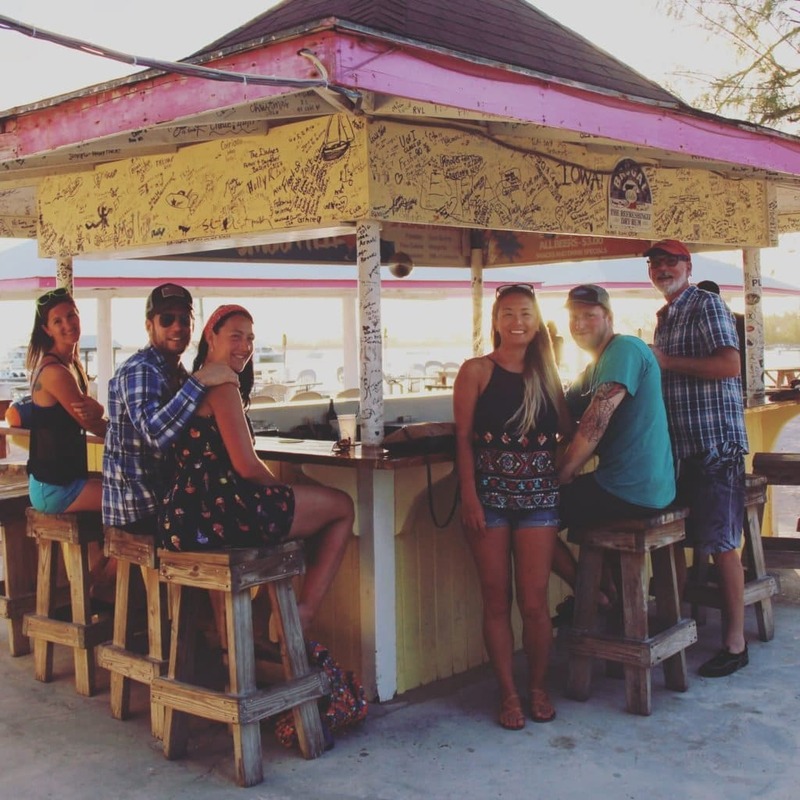 At a small bar on the island of Anegada. We saw many amazing sunsets on the sailing charter. 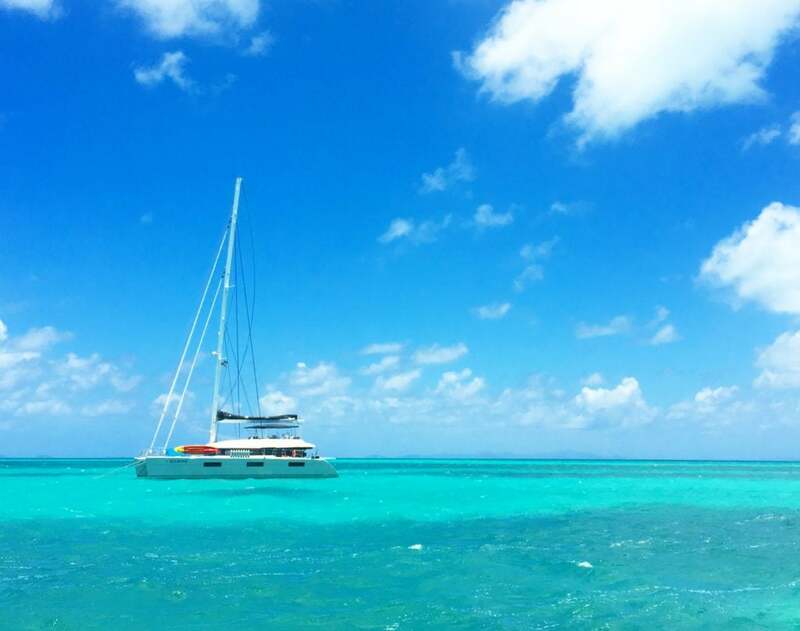 The beautiful blue water that surrounds Anegada – that's the shadow underneath that catamaran! We snorkeled a lot on this sailing trip. Wow!! That sounds like a crazy awesome trip! Basically, that’s the dream right there! 🙂 I am taking notes for my future travels, and apparently adding a sailboat trip to the list. How did you stay connected to your work while out on the boat? I am sure that work wasn’t a high priority on the trip, of course! Those pictures are so amazing! I’m glad you loved it!! The water was horrible. Some people started drinking it but I couldn’t at all. And, I’m a BIG water drinker – it’s pretty much all I drink. 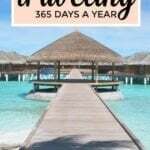 Thanks to Financial freedom you are able to travel the world! Must have been an awesome experience. 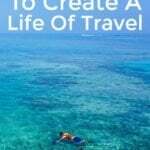 Ever thought about going to Caribbean islands like Barbados or Jamaica? Gorgeous pictures. Looks like you had a great time. One of my best friends lives in Antigua and I can’t wait to go visit him and sail across different islands! Looks like an absolutely incredible trip! Thanks for sharing. Oh my gosh, this is amazing. I currently live on a sailboat and we’re getting it ready for world travel. Just reading about your trip makes me want to go RIGHT NOW! haha. Do you think you’d ever give up the RV life for one full-time on a boat? There are definitely pluses and minuses of both, I would think. So awesome, Michelle! Loved the post, photos, video and tips! My wife and I hope to do this someday! Thx for sharing all of this! 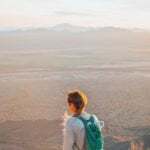 Your trip looks incredible! Isn’t sailing fabulous? I want to do the VI or BVI now that we sailed a few Greek Islands out of Athens in June 2016. 8 Australian colleagues/friends and 2 “others” (aka Americans, and that would be us) spent 7 days on a 45′ catamaran (lots of room and we ate every meal on the back deck with fantastic views). Incredible time and memories, even during two days of severe wind when we had to hunker in port. 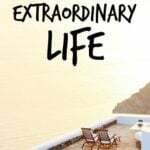 Just gave us more time to explore the island of Sifnos! We’re talking about maybe a sail out of Barcelona next June (we all attend an industry conference in Europe every June). Woo hoo! You said to taste the water before you buy it. is that even possible–trying before buying it? So weird that it tasted like pizza. What do you think that’s from? I’m not sure why it tasted so bad. I tried looking it up and I couldn’t find anything. I have heard of other people trying the water before they provisioned for a long trip, though. I just wish I would have known beforehand, haha! THE PIZZA TASTED LIKE WATER. hahahahahahahahaha I literally laughed out loud at this. That’s so great you didn’t get sick. We went on a cruise recently and my mom was so sick she got those bands and felt better automatically. I can’t help but think those bands are a placebo. Like, what is it actually doing to help the sickness? LOL Gorgeous photos! Haha someone had one of those bands on our trip. Not sure if they helped. These are some cool pictures especially the sunset pics and the snorkeling one. Good thing you didn’t get seasick unlike the other people on the trip. The pictures are so beautiful!! I couldn’t really imagine your trip until I saw all the pictures. I imagine it was a lot of (really fun, exciting) work to sail the boat! The only sailing experience I’ve ever had is on my dad’s Hobiecat. What a trip of a lifetime– and it probably really helped that you guys had two knowledgeable guys on board. Thanks so much for sharing! LOVE the video! The “squall”, in particular, rang true with me. We’ve vacationed twice via bareboat charter in the BVI, and I remember like yesterday “the squall” and the swim mask required to steer through it. A magical place, indeed. Glad you got the chance to enjoy it. The Bath’s will always have a special place in my heart. We work to save our money, but sometimes we just need to enjoy it. I can think of few places I’ve enjoyed it more than the BVI. Wow, it looks like you guys had an amazing time. Minus the pizza water lol. I myself would like to live on a sailboat for a few years. We would want to take some courses to learn how to do it “on our own”. What type of class did your husband take? Thanks for sharing! He took an 8 day course through an ASA certified school. If you’re in the USA, I don’t think there’s a better course than that. Looks like a wonderful trip! I used to be in the Navy and would swear to myself I’d never go on the water again, but after seeing this post I think I’d give it another whirl. It’s different when you are sailing for leisure rather than for your job. I love your story, keep it up! haha we loved the trip! This trip is on my list for when my kids are a little bit older. I will definitely need a captain though as neither my husband nor I sail. Love all of the photos! I checked out the link to the boat you guys sailed on and wow, I can’t believe you comfortably fit seven adults in there! The trips looks like it was awesome and you covered a lot on the 10 days! Yeah, it was actually enough space and comfortable. We were surprised too. Looks like an awesome trip, thanks for sharing. Looking forward to when I will be able to do something similar. That sounds amazing. I love those beautiful pictures. I don’t have any sailing experience yet, but I am so looking forward to it. Thanks for sharing. Wow! The pics look amazing. Thanks for sharing Michelle. I have an eternal fear of large bodies of water. I am missing out on so much vacation time as everyone else I know insists on going to beaches or water park resorts or islands etc. I would still love to travel the world and visit awesome places. Ah, that looks amazing – I’m so jealous!! Not a bad place to work remotely, if I must say so myself. I guess I might get a little seasick if I was on the computer too much though. You’ll have to start training the dogs so they can go with you next time! Looks like an amazing trip. What an awesome trip. We sail the San Juans in a 26 footer. It’s much smaller but there’s only the two of us. We love being out on the water. It is so relaxing. Might I ask how much it was to rent the boat for 10 days? The cost for the 10 days in the month we were there was around $8,000. I think that averages out to around $115 per day per person for the 7 people we had. I’ve been on a casino gambling boat a few times, but I’ve never sailed before. To be honest, I’d be worried that I’d get sea sick. Those pictures look amazing, though. What a cool adventure. Ny boyfriend sails and he is eager to introduce me to sailing as well! I would probably really enjoy a trip like this! Wow 10 days around those beautiful islands would be so luxurious. I spent a week on a yacht around some smaller greek islands a few years ago with a group of friends and it was filthy by the end! Great hints on what to take (especially the underwear haha). Haha yeah I didn’t take a real shower for 10 days on the trip. It was all showers on the back of the boat, haha! Wow this looks like something that I would enjoy doing! Looks like paradise! I really want to get into sailing as it is a great way to travel and discover places. Thanks for sharing! Did you ever have any sea sickness problems? Those pictures are so gorgeous! Snorkel paradise for sure! What an incredible adventure. Love the way you did the layout and route as well! This looks like an amazing trip! I could definitely get used to that lifestyle and being surrounded by water. It looks so relaxing and tranquil. Wow! This looks like it was an awesome experience! I’ve always wanted to live on a boat for a few days to see what it’s like… haven’t gotten to living the fantasy yet though… ; ) lol Your pictures are amazing! The lobster dinners sound delicious! I’ve been wanting to sail the BVI since seeing a friend’s photos of Sandy Spit. Thanks for the helpful tips! Sandy Spit was great! I wish I would have taken more photos of it. Ah, what an incredible adventure! I had no idea you could rent boats like that. I actually went on a boat for the first time the other day, just a day trip in the Papagayo Bay, and since then I’ve been DYING to get back on the water. I can’t imagine living on a sailboat full-time, I feel like I would go crazy but I think a short term adventure would be fun! Out of curiosity, how much does it cost to rent a sailboat? It all depends on when you go, how large your boat is, etc. I think a good average would be around $100-$150 per night per person. My husband and I currently discussing doing exactly this in BVI!! We sailed with friends in Thailand last year, and loved it. We want to do it again, just our family of 4 – and a captain b/c we’re newbies. Thank you for sharing! This looks awesome! We’d love to do a little sailing through the Caribbean, so hopefully soon! Always a fun way to explore! This is such a beautiful post. Although I have a problem of motion sickness, but I still would love to sail through Mediteranean. I have a question. Tell me about the feelings at night. Did you lie down under millions of stars? Oh my god, as if your descriptions weren’t enough to make me insanely jealous, those pictures sent me over the edge! Amaazing post, haha.